A Francis Street home suffered moderate damage in an afternoon fire Monday 27-June at 14:09. Engine 26 arrived to find light smoke coming from the eaves of the single story brick veneer dwelling at 402 Francis Street. The home owner arrived home to find the building in this state and called Fire-Rescue. Firefighter-Paramedics deployed one 1-3/4 handline, making entry through the front door. They found the fire just inside the living room and quickly extinguished the flames, containing it in the area of origin. Click here for more information. A 23 year old male received a single gunshot injury to the face at a location on Clinic Drive in the Jacksonboro Community Sunday afternoon 26-June. At 13:50, 9-1-1 received reports of the incident. The victim had gone approximately three blacks away to the Kangaroo Gas Station located at 16273 ACE Basin Parkway (US Hwy 17) seeking help. Sheriff’s Deputies and DNR Officers cleared the scene for other responders. Firefighter-Paramedics found the man on the ground near the front door of the establishment. Click here for more information. Two people died after being struck by a minivan in the 4700 block of Jefferies Hwy (US Hwy 15) south of Honey Lane Saturday evening 18-June. 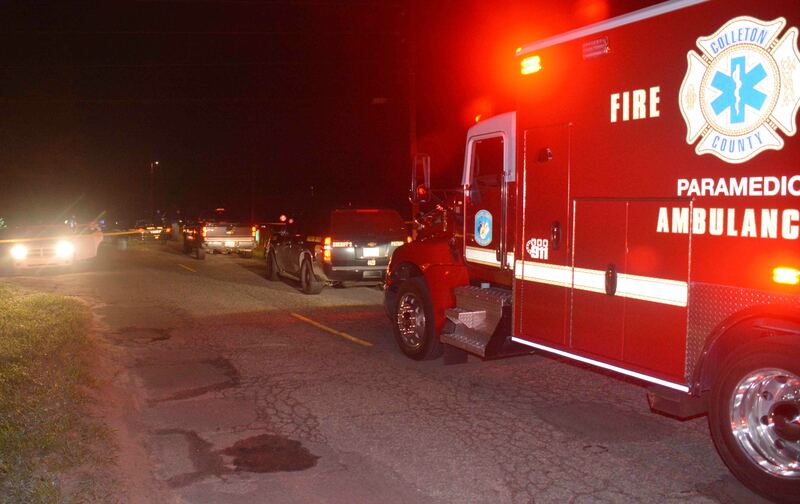 At 21:54, 9-1-1 began receiving multiple reports of the accident advising two people had been struck by a car and were laying in the roadway. 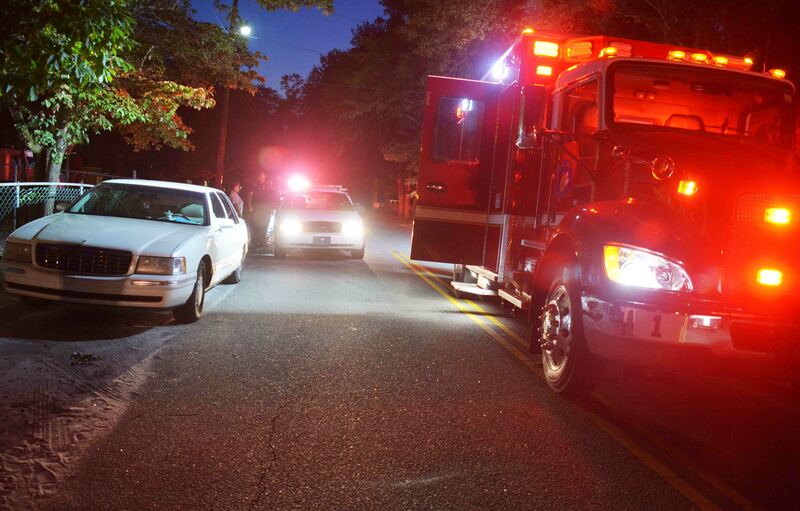 A Dorchester County EMS ambulance, traveling northbound on Jefferies Hwy. returning to Dorchester after dropping off a patient at Colleton Medical Center, was flagged down by the people at the scene. Click here for more information. We express condolences to Captain Jack Wimberly and his family on the death of his grandfather Joseph Wimberly. Mr. Wimberly passed away Tuesday 14-June after a short illness. He was 94 years old. Funeral services were held in Saint George on Friday. Please remember the Wimberly family in your prayers. An adult female died of a suspected gunshot wound during an incident that occurred at a mobile home in the 200 block of Chestnut Drive Saturday morning June 18 at 00:43. 9-1-1 received several reports of gunshots fired in the area. Sheriff’s Deputies arrived to find a four door sedan in the westbound ditch on Chestnut Drive at the head of the driveway with the unconscious female inside. A second vehicle was also at the scene. Firefighter-Paramedics arrived minutes later and determined the woman had no signs of life. Click here for more information. A severe weather event quickly ran through the southern portion of Colleton County Sunday afternoon, causing wind damage and what witness advised was a tornado that crossed I-95 near the 45 mile marker at 16:42. The event knocked down several trees from the 46 to the 44 mile markers on both the north and southbound sides of the highway. Debris was in the roadway from the 44 mile marker as far north as the 49 mile marker. Traffic was stopped in both directions for over eight miles. Click here for more information. 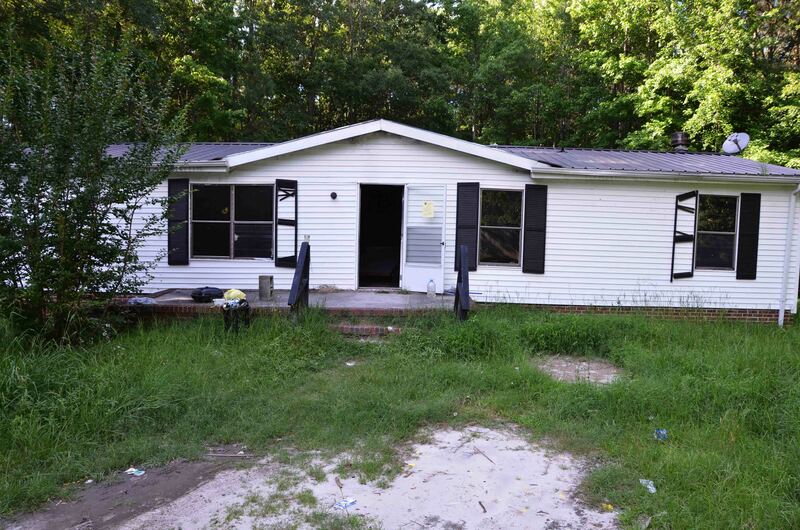 Walterboro Police Officer’s responding to an altercation report at 1002 Carn Street found a 30 year old male stabbed twice and a second man with a hand injury. The incident was reported at 20:15, Saturday evening 11-June. The 30 year old patient was treated at the scene by Firefighter-Paramedics for two non-life threatening stab wounds to the upper leg. 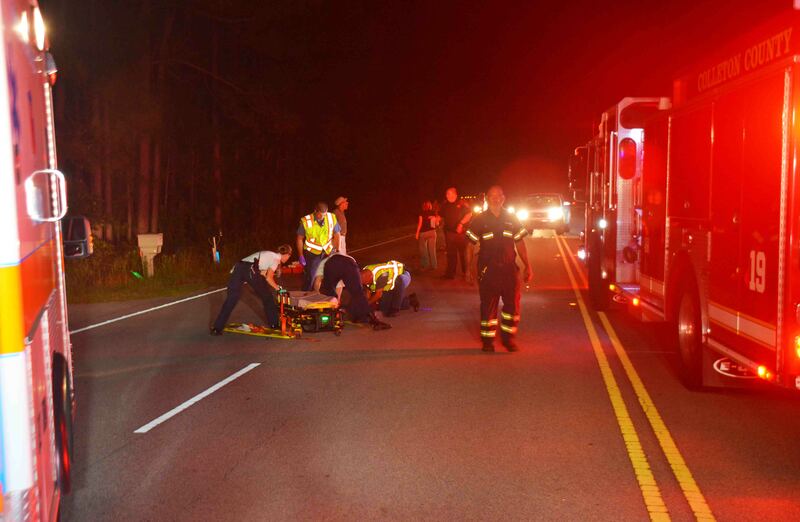 He was transported by Fire-Rescue Medic 1 to Colleton Medical Center. Click here for more information. Fire-Rescue sent two Tenders to assist with a fire at Dan’s Recycling Plant located at 1191 White Sands Road in Holly Hill. At 02:54, Orangeburg County Fire Officials called requesting Tenders for water supply. 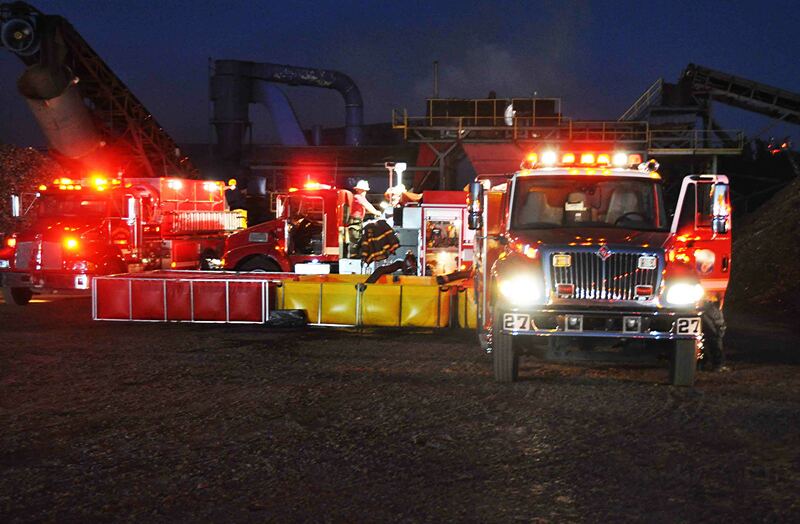 The fire involved several pieces of equipment, piles of sorted debris and vehicles. Units from Orangeburg, Dorchester and Berkeley Counties also responded. 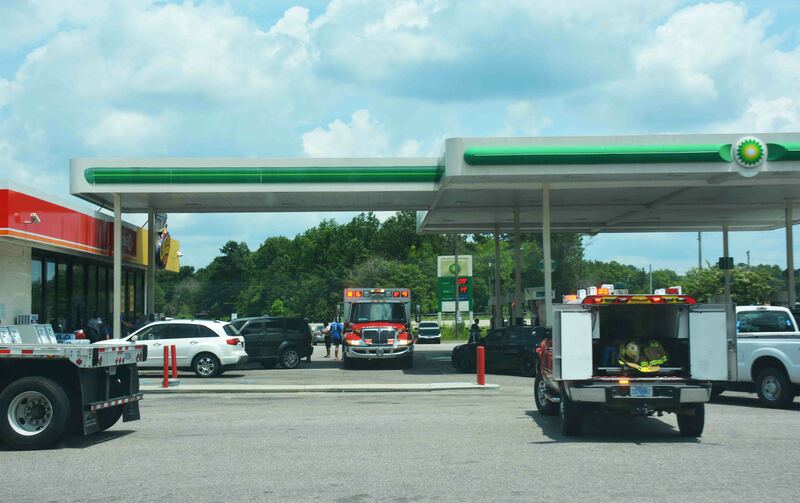 Colleton Units were on the scene for about three hours shuttling water. Click here for more information. 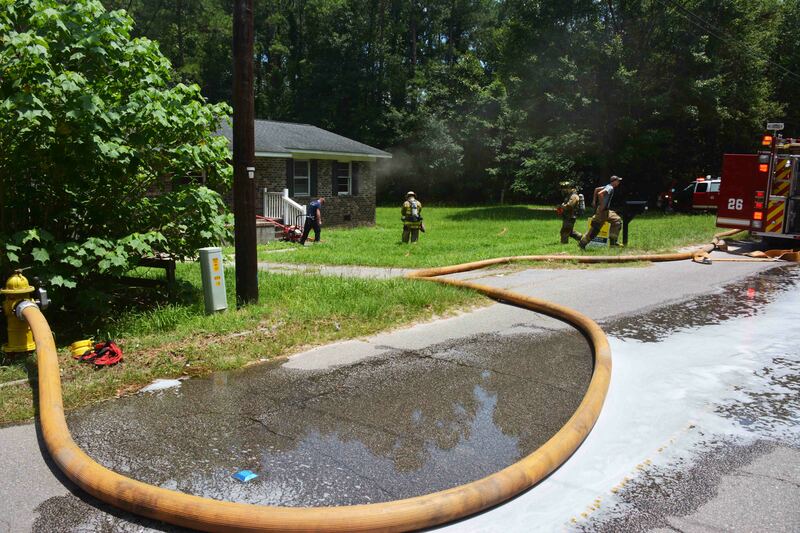 A residence at 409 Roadside Drive suffered substantial damage in an intentionally set fire that occurred before 08-June. The owner arrived at the rental property Wednesday afternoon at around 17:27, after a renter recently vacated the property. The doublewide mobile was unsecured. As the owner entered the building, they found the interior of the home had fire and smoke damage. They contacted the Sheriff’s Office, who called Fire-Rescue. Click here for more information. A two car, high speed MVC at the intersection of Augusta Hwy and Dixie Road sent one man to the hospital Tuesday morning 07-June at 08:49. A car pulled into the path of an east bound van causing heavy damage to both vehicles and trapping the driver of the Cadillac. The vehicle had approximately two feet of intrusion. The driver of the van was not injured and refused ambulance transportation. Firefighter-Paramedics stabilized the 18 year old driver of the Cadillac, while other crewmembers used Holmatro Rescue Tools to extricate the teenager. Click here for more information. 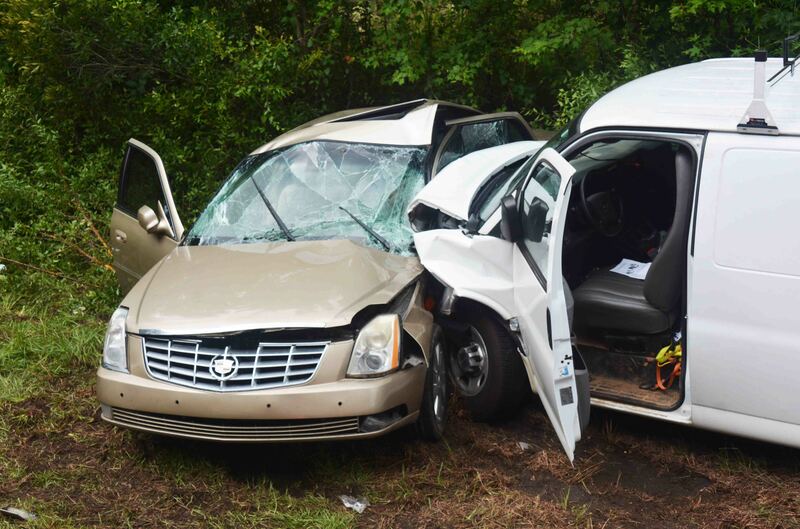 Two elderly adults received non-life threatening injuries after their camper lost control on I-95 during a heavy rain storm related to Tropical Storm Colin. At 10:45, 9-1-1 received multiple reports of a camper towing a small car that had over-turned near the 55 mile marker northbound. 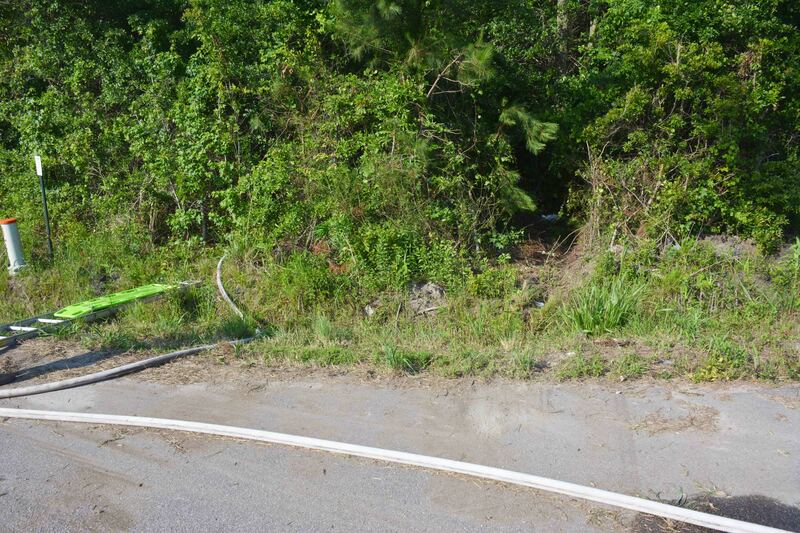 Engine 1 arrived to find the vehicle on its side down an embankment in a swamp. The camper had struck several trees. Click here for more information. 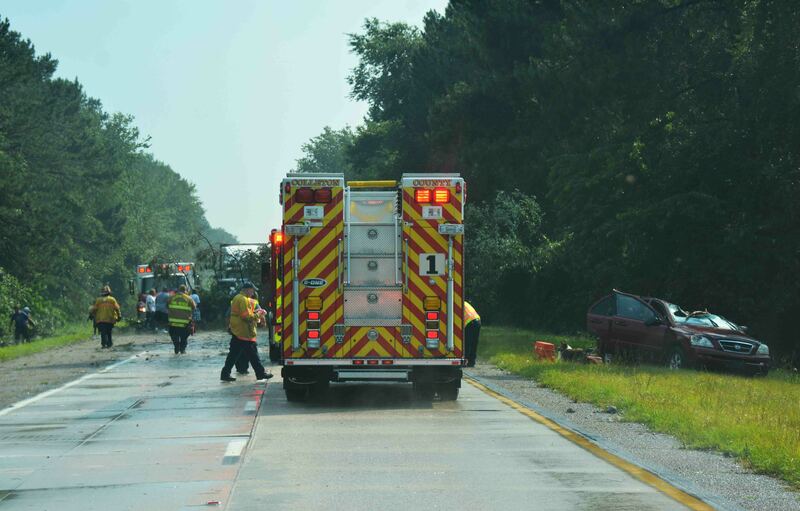 A adult male suffered multiple traumatic injuries after his motorcycle was re-ended at a high rate of speed on I-95 near the 50 mile marker Sunday morning 05-June at 06:20. 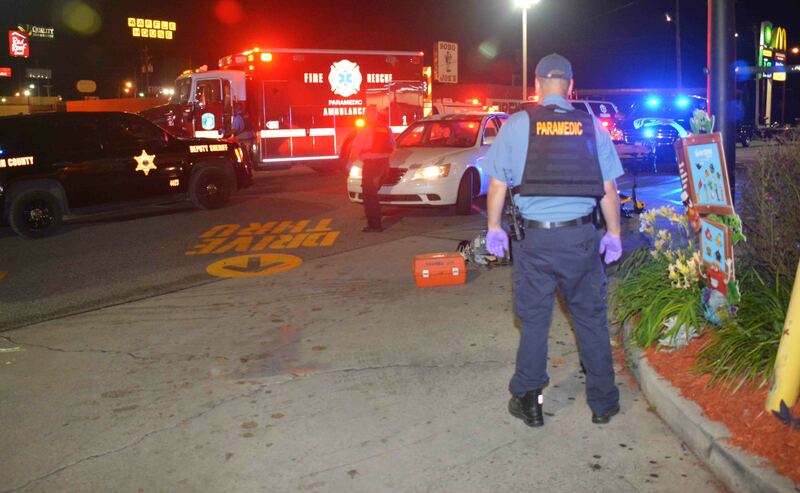 The northbound Harley Davidson motorcycle was hit by a northbound Ford pickup truck. The driver was ejected from the bike and slid to the grassy shoulder of the road. 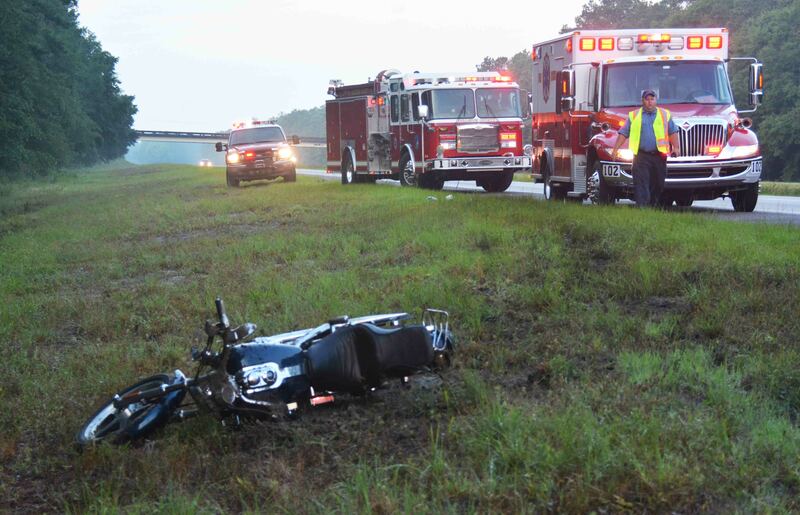 The motorcycle traveled several hundred feet before coming the rest on the shoulder. Click here for more information. An adult male received critical injuries in a single vehicle crash at the intersection of ACE Basin Parkway (US Hwy 17) and Pon Pon Plantation Road Saturday afternoon 04-June at 17:23. 9-1-1 received several reports of the accident, advising a pickup truck left the roadway at a high rate of speed and entered a wooded area. The truck was not visible from the highway. 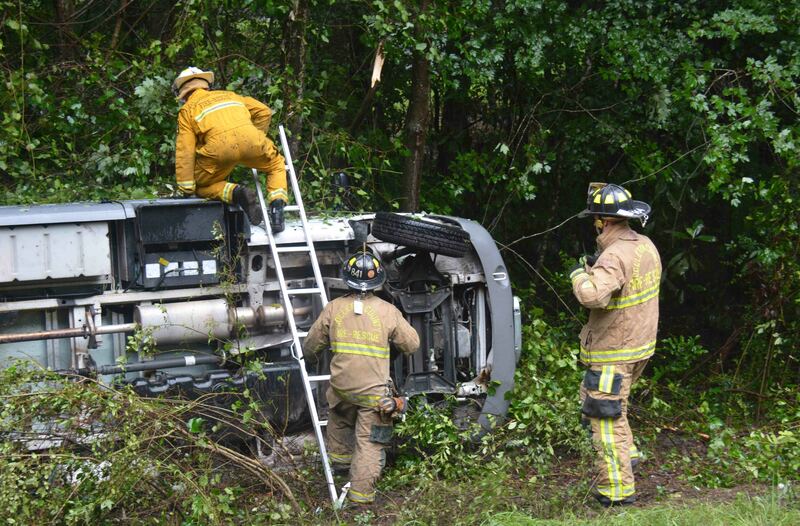 A bystander entered the woods and advised the truck was over-turned with the driver trapped inside. Click here for more information. Two adult males were shot, one fatally, at an incident that occurred at the drive through of a McDonalds Restaurant located at 1404 Sniders Hwy. in Walterboro, Saturday morning 04-June. At 03:15, 9-1-1 received reports of a person shot in the parking lot of the Quality Inn located at 1286 Sniders Highway. A Walterboro Police Officer responding to the incident also found an adult male lying unconscious in the parking lot of the McDonald’s Restaurant located in front of the motel. Click here for more information.